This offseason, MiLB.com is honoring the players -- regardless of age or prospect status -- who had the best seasons in their organizations. We're taking a look at each team to determine the outstanding seasons in Minor League baseball. Select a team from the dropdown below. The 2012 season didn't initially look like a promising one on paper for the White Sox's Minor League system, which began the campaign with only one prospect listed in MLB.com's Top 100 -- reliever Addison Reed just made the cut at No. 100. Like the parent club on the South Side, however, several Sox affiliates put together strong runs, if ultimately falling short of titles. Triple-A Charlotte had its best season since capturing the International League crown in 1999, going 83-61 to win the IL South before falling to Pawtucket in the Governors' Cup Finals. After reaching the postseason in three of the previous four seasons, Birmingham fell to ninth in the 10-team Southern League at 63-76. Winston-Salem won the Carolina League South Division in both halves and led all full-season Minor League clubs with a .630 regular-season winning percentage but was unable to capture its first championship since 2003, losing to Lynchburg in four games in the Mills Cup Finals. Class A Kannapolis was a .500 club at home but went 27-44 on the road to finish 12th in the Sally League. Great Falls captured a first-half division title in the Pioneer League, losing in the opening round of the playoffs, and Bristol limped to a 19-46 record -- including a 9-24 mark at home -- worst in the Appalachian League. Catcher -- Kevan Smith, Kannapolis (86 games), Winston-Salem (22 games): A 2011 seventh-round pick out of the University of Pittsburgh, Smith cooled off after an outstanding rookie campaign with Bristol and Great Falls last year. Nevertheless, the burly backstop -- he's 6-foot-4 and 240 pounds -- finished fifth in the organization in RBIs and fourth with 30 doubles while throwing out 36 percent of potential base stealers. Smith added two homers and six RBIs in six Carolina League playoff games, although Winston-Salem club fell to Lynchburg in the Finals. 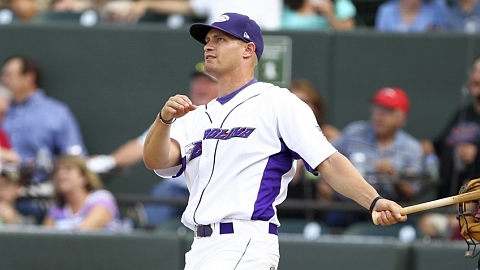 First base -- Dan Black, Winston-Salem (129 games): Black was another stalwart for the Dash, who posted the best regular-season record among full-season Minor League clubs. The Purdue product, who turned 25 in July, finished second in both the White Sox system and the Carolina League with a .315 batting average and earned MVP honors in the Class A Advanced circuit. The highlight of Black's regular season came as April turned into May. In the midst of a seven-game road trip, he went 4-for-5 with a homer, two doubles and two RBIs at Potomac on April 30, then followed with a 5-for-6 performance the next night. The effort raised his batting average from .278 to .337. Black was a road warrior for the Dash all season, posting a .335/.421/.552 line with 13 of his 17 homers coming away from BB&T Ballpark. A switch-hitter, Black also feasted on left-handed pitching, hitting .382/.457/.634. Winston-Salem skipper Tommy Thompson, who also managed Black in Kannapolis in 2011, said pushing hard is all Black knows how to do. "He gets after it," Thompson said. "He's very committed. I don't have to tell him to do things. You wish you had 25 guys like that." Second base -- Carlos Sanchez, Winston-Salem (92 games), Birmingham (30 games), Charlotte (11 games): Still a teenager when he began the season in Winston-Salem, Sanchez tore through two levels -- with a stop at the All-Star Futures Game in Kansas City in July, where he went 1-for-2 -- and finished the campaign by going to the IL Finals with the Knights. He's not done yet, either, as he's playing for the Salt River Rafters in the Arizona Fall League. Sanchez, a Venezuela-born switch-hitter who also spent significant time at shortstop, led the organization with a .323 batting average and finished fourth with 26 stolen bases (although he was caught 15 times, which was tied for most in the system). Joining the Double-A Barons on July 21, Sanchez batted .370 with 44 hits in 30 games before earning another promotion to Charlotte. "He's going to be a special player," said White Sox director of player development Nick Capra. "He has great instincts, can play both second and short and is a solid switch-hitter, with maybe a little more power from the right side. "At the Futures Game, they had him playing third -- where he's had almost no experience -- and he made a real big league play there." Third base -- Eric Grabe, Bristol (42 games): A hamstring injury suffered in mid August cost Grabe a shot at the Appy League batting crown, but the 24th-round Draft pick still put together a brilliant debut campaign. The infielder, who split time between second and third, hit .357 and was named team MVP and an Appy League All-Star. Grabe fanned 24 times and drew 19 walks in 42 games for a .442 on-base percentage and finished with 50 hits -- one behind Kale Kiser for the team lead -- despite playing in 13 fewer games. Drafted after his senior season at the University of Tampa, Grabe (who turned 23 in August) is behind the curve for his age, but he's off to a great start. Shortstop -- Marcus Semien, Winston-Salem (107 games): A 2011 sixth-round pick out of Cal-Berkeley, Semien lifted his on-base percentage 42 points and his slugging percentage 95 points in a breakout sophomore season with the Dash. His 80 runs scored (in only 107 games) ranked fifth in the system while his 31 doubles were good for second. The California native, who turned 22 in September, provided some pop at the top of the lineup, bashing 14 homers during the regular season and adding two in the playoffs. Semien saved one of his biggest games for when the Dash needed it most. After dropping the opening game of the best-of-3 Carolina League semifinals and having its manager ejected in the third inning of Game 2, Winston-Salem rallied twice behind a homer, double and three RBIs from Semien to top Myrtle Beach, 5-3, and force a decisive third game. Designated hitter -- Cyle Hankerd, Kannapolis (nine games), Winston-Salem (74 games): A 2006 third-round pick out of Southern Cal, Hankerd was named Northwest League MVP that summer and earned All-Star honors in the Southern League in 2009. Without a Spring Training invitation this year, he took some time off before joining independent Amarillo. Four games in, the 27-year-old got a call from the White Sox and soon emerged as a big bat down the stretch for Winston-Salem. Hankerd clubbed a career-high 20 homers -- third-most in the system -- and drove in 65 runs in only 83 games. "Home runs are kind of accidents," he told MiLB.com's Jeff Seidel in July. "I'm still a gap-to-gap hitter." "He's been tremendous for us on and off the field with his leadership and production," Thompson said. "He brings experience and he's a quality person. He's great to have." Brady Shoemaker, Winston-Salem (78 games), Birmingham (56 games): Shoemaker posted a host of impressive statistics in his third full season, tops among them a .416 OBP that led qualifying White Sox farmhands. Not coincidentally, he also led the organization in runs scored (91) and ranked fourth with 75 walks. A 25-year-old Indiana State product who was drafted in the 19th round in 2009, Shoemaker earned both mid- and postseason All-Star honors for the third time in four years (Appy League, 2009; Sally League, 2011; and Carolina League, 2012) to go with two Carolina League Player of the Week awards. At the time of his promotion to Double-A in early July, Shoemaker was among the top three Carolina League hitters in average, on-base percentage, slugging, hits, doubles, homers and RBIs, and he won Home Run Derby at the California/Carolina All-Star Game in June at Winston-Salem. After hitting .331 with the Dash, Shoemaker's batting average dipped to .254 with Double-A Birmingham, but he still reached base at a .408 clip. "Sometimes the numbers can be misleading," Capra said of Shoemaker's batting average with the Barons. "He really hit the ball on the nose there but had some bad luck with balls going right at people. He was one of the most consistent hitters we had in the organization this season." Trayce Thompson, Winston-Salem (116 games), Birmingham (14 games), Charlotte (six games): Thompson is one of the most exciting players in the system, possessing great power and speed at the tender age of 21. He also strikes out a lot -- 166 times in 136 games this season -- but that's a price the Sox are more than willing to pay as Thompson hones his craft. A 2009 second-round pick, Thompson led the organization with 96 RBIs and ranked second with 25 homers and 31 doubles while adding 21 stolen bases, seventh-most in the system. He led the Carolina League in both homers and RBIs before earning brief stints at both Double-A and Triple-A. The son of Mychal Thompson, the top pick in the 1978 NBA Draft, 6-foot-3 Trayce has plenty of athletic ability to cover center field. Two older brothers also play pro hoops. "He has a chance to be a superstar if everything clicks," Capra said. "He covers a lot of ground in the outfield and has an above-average arm. The strikeouts are a concern, but he's still young and still making adjustments -- and anyone in baseball will take a guy with that kind of talent and 25 homers and 90 RBIs." Keenyn Walker, Kannapolis (74 games), Winston-Salem (37 games): The 47th overall pick in the 2011 Draft, Walker has a knack for getting on base and making things happen. The switch-hitter, who turned 22 in August, worked in Spring Training on widening his stance to make better contact. That's still a work in progress, but Walker's raw talent already has made him a prospect worth following. Despite a .267 batting average and 143 strikeouts -- third-most in the organization -- Walker drew 74 walks and stole a system-best 56 bases, leading to 84 runs scored in 111 games. Walker spent time on the disabled list in June but came back and hit better than .340 in June and July before his promotion to Winston-Salem. "He's another young guy who's still making adjustments," Capra said. "He hasn't played a ton of baseball and needs to learn to make contact and hit with two strikes, but honestly, he made about as much progress as anyone in the system this season." Right-handed starting pitcher -- Andre Rienzo, Winston-Salem (four games), Birmingham (13 games), Charlotte (one game): Rienzo was coming off solid campaigns at Kannapolis in 2010 and Winston-Salem in 2011 but made huge strides this season, holding opponents to a .206 average over 103 1/3 innings across three levels. Beginning the season again with the Dash, the Brazil-born right-hander was overwhelming in four starts, going 3-0 with a 1.08 ERA and 31 strikeouts in 25 innings. Jumping to Double-A Birmingham in June after serving a 50-game suspension for a performance-enhancing steroid, Rienzo won three of his first four outings while allowing only three runs. "Yes, I took some supplements in Brazil," he said after his return. "I never took anything I didn't think I couldn't take. I'm from Brazil. They know how hard it is for a Brazilian to be here. It's stupid, but I know I'm responsible for what I put in my body. "I learned a lot. I learned you never take anything without knowing everything that's in it. Now I need to be more responsible. ... I love the game more." Rienzo is getting a chance to make up for the missed time in the Arizona Fall League, where he's pitching for the Salt River Rafters. "We think he's got a chance to be a solid Major League starter," Capra said. "Being from Brazil, he doesn't have as much experience as some other guys and he's still learning how to command his fastball. But he's got an above-average breaking ball and his changeup is improving. He's got the tools to be a good one." Left-handed starting pitcher -- Scott Snodgress, Kannapolis (19 games), Winston-Salem (eight games): A 2011 fifth-round pick out of Stanford, Snodgress opened his first full season with Kannapolis. He was solid with the Intimidators, going 3-3 with a 3.64 ERA in 19 starts. Taking a step up to the Carolina League in late July, the 6-foot-5 southpaw also took his game to the next level. Snodgress fanned a career-high 10 batters over six innings in his Class A Advanced debut on July 24 and combined with two relievers on a one-hit shutout on Aug. 10 at Potomac. Snodgress led the system with 128 strikeouts over 141 innings and held opponents to a .217 average -- just .176 in eight starts for Winston-Salem. Relief pitcher -- Taylor Thompson, Bristol (one game), Winston-Salem (33 games): A number of relievers had strong seasons in the system, but none showed the shutdown power of Thompson, who notched 12 saves with the Dash while striking out 11.7 batters per nine innings. The 25-year-old right-hander, a 44th-round pick out of Auburn in 2009, saved 15 games for Winston-Salem in 2011 but raised his strikeout rate, dramatically cut his walks and boasted a .171 average against while posting an organization-best 0.88 WHIP this season. After an iffy start -- the two homers he surrendered came in back-to-back outings on May 10-13 -- Thompson did not allow an earned run in his final 17 appearances spanning 23 innings. He gave up eight hits and three walks while fanning 29 during that stretch.